Web design and development are one of the most in-demand skills in last years. Agree? As online business are grows, more and more clients are willing to pay large amounts of dollars for their sites to those with the right skill sets. You’ve probably have learned how to create an HTML and CSS website but, chances are, these sites won’t make any more sense for a big business or even blog site nowadays. This is the very reason why it’s important that there should be WordPress conversion of your site from HTML and CSS. At first blush, there are a number of reasons why you would choose to have a static (HTML and CSS) website. Why do people have static websites in the first place? You want to make it easier to customize your site even if you are not a developer. A static website is supported on almost every browsers. But when it comes to functionality, a dynamic site like a WordPress site is the best way to go. Static websites cannot produce dynamic output alone since it is built on a static language. Faster turnaround. You need not spend a lot of time on getting the colors and layout right. You can go straight to admin panel to customize it. Templates look much better than sites developed in traditional static HTML sites. You don’t need to code if you want to add a page or a post. Simply go to the admin panel. Security features offered by HTML are much more limited than a dynamic site like WordPress. If you started with a static (HTML and CSS only) site, you don’t need to throw it all away when you want to move to WordPress. However, converting your HTML-and-CSS-only site into WordPress might require some programming knowledge like PHP and jQuery to run the static site on the dynamic WordPress platform. In the previous tutorial, you learned how you can create a WordPress child theme. This WordPress two-part tutorial series will introduce the basics of converting the markup into a fully functional WordPress theme using the built-in NeoBlog HTML and CSS theme. At the end of this tutorial, you will learn how you can convert your static HTML and CSS site into a fully driven dynamic WordPress site.This tutorial aims to provide more flexibility to the site owners, thus, giving you more power to do more on your site. What Codes Should Readers Take Note Of? A WordPress theme is a way of ‘skinning’ the external design of your website. The theme can make a big difference to the overall look of your site. It offers a graphical interface via the WordPress template files. Be careful of the name of the templates file you created. By default, WordPress recognizes the default template name such as single.php and page.php file. I recommend checking the name of the default WordPress template before naming or creating a new custom file. Check out WordPress Codex for some functions, tags or some other PHP codes before using it on your template files. This will keep you on the right track on what you want to do in your codes. Sometimes you need some external jQuery files to improve the look of your WordPress theme or add some functionality. WordPress will not provide everything in a box. Backup your files. You never have anything to lose by creating a backup. As a precautionary measure, you should backup all of your theme files, plugins you are using as well as some other files related to your theme development. Why You Need to Take Note of PHP? PHP is a programming and scripting language that creates dynamic interactive websites. It is a widely-used and open-sourced general purpose scripting language that is especially suited for web development. In addition to that, this programming language can be embedded into HTML. WordPress is written using PHP as its scripting language. This has an open source license, certified by the Open Source Initiative. Just like WordPress, PHP is also open-sourced. Some parts of the WordPress code structure for PHP markup are inconsistent in their style so it is important you have a basic knowledge about PHP. First, you will identify first the files you need to create to build a complete WordPress theme. The next step you will do is to start putting codes on each template files. Along the way there will be functions that might not be clear to you. In this case, the WordPress Codex will be your best friend. After you created each template, you will add contents to your theme to test if the whole codes you are using are working on your site. 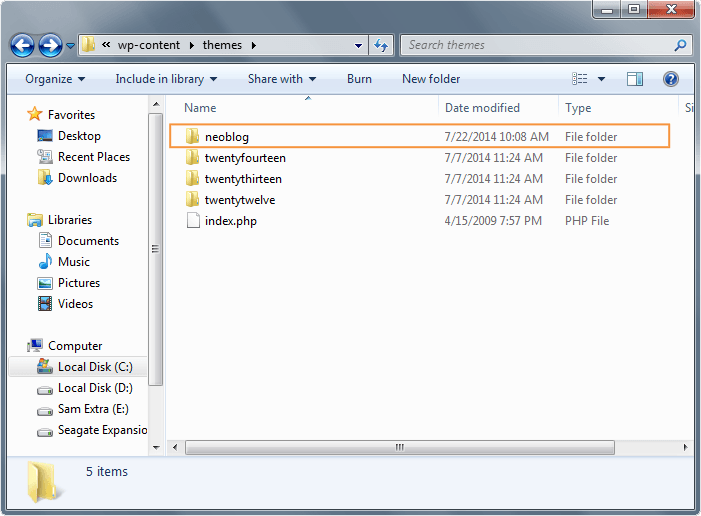 To start converting your NeoBlog WordPress theme, create the theme folder in the wp-content/themes directory in the WordPress installation folder. Please take note that the name of the folder should correspond to the name of the theme you want to create. For this tutorial, it is named NeoBlog. Compared with static HTML and CSS sites, a WordPress theme consists with a bunch of template files. css folder – This folder contains all the stylesheets. Copy this folder from the NeoBlog HTML and CSS theme. fonts folder – This folder contains all the external fonts used in the markup. Copy this folder from our NeoBlog HTML and CSS theme. images folder – This folder contains all the images such as the logo and so on. This folder will be copied from NeoBlog HTML and CSS theme. footer.php – This file will contain the code for the footer section of the theme. index.php – This is the main file for the theme. It will contain the code for the Main Area and specify where the other files will be included. functions.php – This file behaves like a WordPress Plugin, adding features and functionality to a WordPress site. single.php – This file will contain the basic layout of a blog page. page.php – This file will contain the basic layout of a page. page-contact.php – Another type of WordPress’s built-in Post Types template. This template will display a contact form on the pages it was set. content-search.php – This file will run the loop for the search to output the results. search.php – This file is responsible for displaying search results pages. searchform.php – This file contains the layout of the search form. comments.php – This file will contain the code for displaying comments. sidebar.php – This file will contain the sidebar widget area. 404.php – This file will return a “Not Found” notification if a particular search query is not found or doesn’t exist in the database. style.css – This file will include all of the styles and information of the NeoBlog theme. screenshot – a png image file, that should accurately show the theme design or the title of theme. For more information see check this page. Over the course of this tutorial, codes are going to be added to these files that will include menus, hooks, loops and widgets. To get started, copy the css, fonts, images and js folders from the NeoBlog HTML and CSS theme to the NeoBlog WP theme folder. Before stating with the template files, first add the links of the stylesheets of the NeoBlog HTML and CSS theme to the NeoBlog WP theme. Go ahead and create the style.css file on NeoBlog WP theme and then copy the code below. There is nothing special here but the information about the theme such as the name, author, author’s website and so on are enclosed within comment tags. This will make the theme easily identifiable upon installation. It also has a series of @import tags. This will link the stylesheets from the CSS folder to the main stylesheet of the NeoBlog WP theme, which is this file. Now that the theme has been successfully named thru style.css file, add a screenshot of the theme. Create an 880 x 660 px file in Photoshop and put a title text, the short description and the author of the theme on it. The screenshot will only be shown as 387x 290 px on the WordPress admin panel, but the over double-sized image allows for high-resolution viewing on HiDPI displays. Afterwards, save it as a screenshot.png file on the root directory of the NeoBlog WP theme. 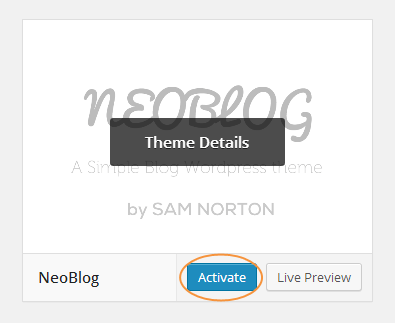 After adding the screenshot of the theme, activate the NeoBlog WP theme. But before doing that, to check on if the theme is working or not, create first a blank index.php on the root directory of the NeoBlog WP theme (don’t worry codes will be added on this later on). 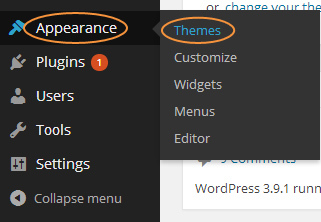 Next, activate the theme, go to the WordPress admin panel and mouse over your mouse to Appearance -> Themes. Click on the Activate button. If you are going to check the NeoBlog WP theme on the front end, you will notice a blank page because you have not put anything on our index.php file yet. While trying out this tutorial, you might have issues with combining PHP codes with the HTML codes. Double check it. It is better that, by this time, double check your codes. Sometimes you might forget putting an end if or end while statement inside a WordPress loop. The code you see below will solve the issue. It would also help if you can check the the ending and closing tags of your PHP codes; otherwise, the codes might not work when mixed with HTML codes. If you want to learn more how to add more functionalities on this blog, you might want to check and study the WordPress Codex. What Limitations Does This Tutorial Have? Although this tutorial will give you a head start on how you can create a theme, there will be limitations on this one. It can only provide the basic features of a blog theme such as the sidebar, footer, search box, post list, featured images and so on. If you want more features you can try to study the WordPress codex as well as online courses on tutplus.com or Lynda.com in creating an advanced theme. You don’t want to read the whole thing? You might wanna try the video version! If you need to know the Part 1 of this tutorial series, you need to watch the whole playlist. Great! We are done with the first part of this two-part series tutorial. In this article, you learned how to set up template files, things to avoid and some notes to look out for as well as the steps in creating a WordPress theme. If you’re using WordPress, you’ve probably spent a long reasonable period of time searching for a theme you like, only to find out that you’ve been looking at the same theme designs in a variety of colors with just different set-up of elements. Maybe, it’s time you learned to create your own WordPress theme. This series of tutorial will help you learn to convert an HTML and CSS template at the same time build your first basic WordPress theme. We’ll get under the hood and see how a basic theme works by going over on the template files required to build a fully functional WordPress blog theme. Our HTML file is now prepared and ready to be converted into a set of theme files. In the next tutorial, Let’s work on some template files and add functions to support some functionality of your WordPress theme. It wasn’t as bad as you think it would be, right? Don’t forget that this is just the first part. If you can’t wait, do try this part and tell us what you think in the comments below.